1. This was a game the Steelers absolutely could have (and should have) won, especially considering the fact that the Saints just lost in the same building to Cleveland a week before. The Steelers were outhustled, outplayed, and outcoached last night. 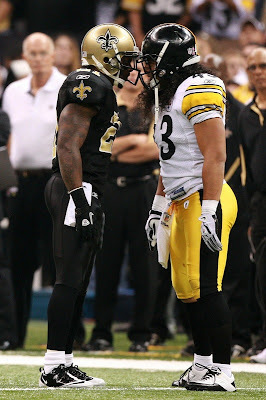 Like I said in my preview, the Saints had a lot more to lose than the Steelers in this one, and it showed. Sean Payton's team just plain wanted it more. No one's going to be calling Pittsburgh the #1 team in the NFL this week, that's for sure. Some flaws were clearly exposed. 2. The first of those exposed flaws was the Steeler offense playing their worst game since the return of Ben Roethlisberger. Even with the Steeler D on the other side, if you told me Pittsburgh would finish with 279 yards of offense and 10 points against the Saints, I'd tell you they were probably going to lose. 3. I feel that the game was lost on the sequence starting with the overturned Antwaan Randle-El touchdown in the second quarter. All you Isaac Redman fans, wake me when he lives up to his undeserved "Red Zone" nickname. How's a guy named Red Zone when he's never scored a touchdown in a regular season NFL game? Can anyone explain that to me? For all the talk about the Steelers getting back to a smash-mouth running game, that series of plays blew that theory into smithereens. Three shots from the one-inch line, and they can't poke it in. You can't settle for three points in that situation and expect to beat the Saints. The game wasn't truly over at that point, but it was such an enormous statement by both teams that it was over in my mind. 4. The Steeler offensive line also took a step backwards last night; actually, they were taking a lot of them, because the Saints had them on their heels, giving Roethlisberger little time to throw and play the style of football that he's used to playing. Saints DC Gregg Williams used an interesting scheme that kept the Steelers very much off balance and never allowed them to get into a rhythm. I hope future opponents weren't watching, but something tells me they were. 5. Speaking of not getting into a rhythm, the Steelers did a very poor job of getting the ball into the hands of the right people last night. Heath Miller had two touches, Hines Ward had three, and Mike Wallace had three. I keep saying it, but that's never going to beat the defending champions. You have to give your playmakers a chance to make plays, and Pittsburgh failed in that department with the exception of the Rashard Mendenhall touchdown run, their lone play of 25 yards or more that didn't result in a crucial fumble. 6. All of these offensive problems aside, the Steelers somehow had the ball down just three points with eight minutes to go. Plenty of time for Big Ben to wave his magic wand, right? Wrong. At the end of a 25-yard pass play, Miller fumbled for just the fourth time in his career with about six and a half minutes to go, leading to the eventual New Orleans insurance touchdown at 2:37 of the fourth after the vaunted Steeler defense watched them go 48 yards in eight plays. Pittsburgh then gets the ball back again, and voila, interception and Saints victory formation. The game was over that quickly. 7. Which bring us to that vaunted defense. Maybe you haven't noticed, but going back to the Cleveland game, the last three opposing QBs have thrown for 281 (McCoy), 257 (Henne), and 305 yards (Brees). Their respective QB ratings were 80, 94, and 101. In other words, this is a problem that's gotten worse as the Steelers have faced increasingly better quarterbacks. In the second half last night, Brees was 20-of-22. 20-of-22!!! He completed 34 passes on the night. The Saints looked silly even trying to run the ball 21 times in the game. New Orleans scored 17 of their 20 points in the second half, when the air attack really took shape. One Ike Taylor pick does not absolve a poor performance from the secondary. The defense also allowed the Saints to convert waaaay too many third down plays. Seven of 16, to be exact. That's what led to a time of possession disparity of nearly 10 minutes in favor of the Saints. It's hard to run a good offense when you don't have the ball. 8. More lowlights from last night: James Harrison getting a roughing the passer call, Jeff Reed missing a 51-yard-field goal (not an easy one, but if you want paid, you've gotta make a kick like that indoors), Mike Tomlin wasting a challenge in the first half on an obvious call, Emmanuel Sanders fumbling for the second straight week, and Antwaan Randle-El's punt returns (or lack thereof). El's actually returned 11 balls this year for a total of 33 yards, with a long of eight yards. I was looking at his return stats, and something leapt off the screen at me. Notice his ratio of fair catches to returns as he's gotten older. His rookie season, it was 37 returns to 11 FCs (3.36:1). His second year, 45:12 (3.75:1). And then something happened. In 2009 in Washington, Randle-El dropped to 17 returns:19 FCs (0.89:1). This year, it's 11:8 (1.38:1). Look, if they're all punts that can't be returned, that's one thing. But I think there's clear evidence of the opposite looking at his stats the past two seasons. Maybe he realized that taking all those extra hits doesn't do a career good, but he's doing nothing to help in the return game. And for those of you who think that it's just a job for fair-catching and not fumbling, don't tell me that the five touchdowns Randle-El's scored in his career via the punt return didn't change the momentum of their respective games at a given moment. I know I'd gladly take a touchdown any way I could get it if I were a head coach. 9. The only other AFC North team in action on Sunday was Cincinnati, and surprise, surprise, they lost again, falling to 2-5. I'd say I was shocked, but that would be a complete and total lie. You can go back and read everything I ever wrote about the 2010 Bengals and nowhere did I say that I believed in them. As for next week, guess who the Steelers have on their schedule? That's right...the 2-5 Bengals, on Monday night football. So be prepared for a week of Ochocinco and T.O. tweeting about what they're going to do to Ike Taylor. I can't wait. 10. It's Sad Trombone time! Today’s recipient of the Sad Trombone: Julius Jones. Julius Jones is a journeyman running back of the highest degree, and lesser-talented younger brother of fellow journeyman Thomas Jones. After being through the humility of asking to take pay cut to keep his job in Seattle this year, the Seahawks rewarded him by cutting him anyway a few weeks later in favor of All-Pro Creep Marshawn Lynch (as I always say, if they've got a "Legal Issues" bar in their Wikipedia page, you know they're usually bad news). So Jones got picked up by New Orleans in October to fill the void left by Pierre Thomas and Reggie Bush, and he's underwhelmed, to say the least. However, last night, something came over Jones, maybe the spirits of Halloween, that caused him to get helmet-to-helmet in the face of Troy Polamalu. Now maybe he doesn't realize what a national treasure Troy is, but some things you just don't do. Getting in the face of Polamalu is a few notches below stomping on a Terrible Towel. You just don't do that. Unfortunately for Jones, that was the most life he showed all night. He had seven carries for 16 yards, with 11 of those coming on one carry. So for messing with our kind-spirited defensive leader and coming up with just 16 yards, Julius Jones gets a Sad Trombone. It's not the loudest of the year, and it will probably rank near the bottom of the list once the season's over, but it was deserved. The last ten minutes of the first half were a killer......the goal stand obviously, but then even bigger the Ike Taylor interception at the 35 that somehow led to a Saints field goal. Killer holding penalty, another Jeff Reed shank, and boom game on. Threw away a chance for 14 points and wasted a spectacular half of defense. While the Steelers were just plain outhustled (like you said) I also put a special amount of blame on Arians head. The Saints were bringing 4+ on most plays and even brought 8 once! Arians' answer: long developing pass plays! When he decided to throw quick passes, we got some first downs. I think the common theme here is missed opportunities. We had several chances to go in for the kill and win the game and just did not take them. That is going to need to drastically change. Our defense was decent enough in the first half, but in the second half Brees had all the time in the world ( I counted about 8-10 blatant holds on Woodley and Harrison that effected the plays and aided this) and his receivers made nice plays to keep the ball moving. However, we made so many inexcusable mistakes that changed the outcome of the game. I can't believe we didn't adjust to their blitz happy defense. The middle was wide open. LeBeau should be used to getting no pass rush because choking our outside rushers is legal and should consider perhaps sending some Corners on blitzes more often. Also, on the Hines PI ( which was unbelievable), did he get hit helmet-to-helmet or what? I was more than prepared for our lame secondary to get picked apart but to be held to 10 points by a defense that allows teams like the Browns to look super and our mistake prone offense helping matters is rediculous. The sooner teams stop trying to run at all and go right to the air with it will be key to beating the Steelers every week. I wouldn't even dress a RB against the Steelers unless he's a FB to be used for pass blocking only. Is it possible to play any softer a zone defense? A healthy Troy obviously isn't helping much either, so there goes that BS theory.. And for the last time; Gay is not a good CB, never was...never will be. Steelers lost this game for a lot of the same reasons the Dolphins lost to us last week. We allowed big pass plays and 3rd down conversions and didn't capitalize on early chances to establish a hold on the game. That said, you didn't figure the Steelers to go 15-1 did you? We lots to the defending SB champs in their house at night after they are coming off an embarrassing home defeat and falling behind in their division. That's a hell of a situation to be up against. As long as the Steelers respond next week, this is a non-issue. Can't win 'em all. 3. I thought Redman was getting a gameday hat for short yardage situations? Why does he only get one of the three goal line carries after that Randle El overturned TD? I agree with the point though... that stop had a uuuuge impact on the rest of the game. 7. How are they gonna lose a game where Ike holds onto an INT? Haha, weak!!! 8. I have been noticing this trend this season too. It seems like El, either fair catches every single punt or catches it and falls forward for 2 yds. As long as E. Sanders or A. Brown are dressed, there's NO reason to have El returning punts. He's proven that he's only back there to FC. If that's the plan, why not send Hines or Heath back there? Or go back to when PSU had Calvin Lowry fair catching punts all season a few yrs ago. If Calvin's even still in the league, i'm sure he could be had for a few practice squadders and a bag of balls. At this point, i'd much rather dress Sanders AND Brown and put El into the free agent pool. Sanders is starting to come on as a legit receiver. So between the two of them, they could easily replace El's production and then some. Too many people remember the El of old (who wasn't even THAT great), and don't realize that this guy who's here now is just old El. @ Steve - that defense didn't really make the browns look 'super'. The cleve steamers only scored 16 offensive pts (30 total, & 14 on DEF). Albeit that 16 points was with a rookie QB making his 2nd career start with some UFL quality WRs. @ ALL - with the bengals being as outright TUURRIBLE as they've been this season... does that scare anyone else next week? I thought the defense played really well. Drew Brees had it going on last night...and they basically held them to 13 points. No big plays (well, the Meachem 52 yarder...which was nullified by the McFadden forced fumble), make them beat you on the short field when you know they can't run it. If the offense had a pulse, I really like Pittsburgh's chances in that game. As usual, the Achilles heel of the Arians/Roethlisberger offense is the all-out blitz...they have shown time and time again that they are incapable of adjusting. This is totally unrelated, but did anyone know that Ray Lewis has 6 kids to 4 different women, none of which live with him? I think most people would disagree that they got outhustled and outplayed. Its probably safe to say that had Heath not fumbled we probably wouldve scored. We shot ourself in the foot. Mendenhall crossed the goalline on 2nd and goal. Tomlin chose not to challenge the play. He wasted a challenge earlier on that kickoff return and it wasnt even close. Tomlins excuse for not challenging Rashards play was bc they dont get any replays on the road. That was a terrible excuse. Isnt that why you have headsets and assistants in the booth to tell you hey Mike challenge this, its a TD. The offense was atrocious. Bail on the run and just rely on Bens arm. Thats my two cents. But everyone says the steelers need to be balanced. Why? Last year we had one of the best passing attacks in the NFL. Like it or not smashmouth football is a thing of the past. Its a passing league now. Look at recent super bowl winners. They were primarily passing teams. Bruce Arians should be on the hot seat. Steelers have too many weapons to perform like they did last night. The saints had a depleted secondary. I expected a much better performance. Now as for special teams Sanders fumbled another kickoff and we gave up a long kickoff return to start the second half. Steelers seem really close to having another special teams debacle similar to last year. At the same time Saints had a playoff environment and a sense of urgency. The opportunities were there. We did not capitalize. I was screaming for them to throw to Heath all evening. They finally did and major disappointment ensued. I agree with those who say the failure to score from the 1 was the turning point. Both sides of the ball regressed last night. The offense was is of bigger concern IMO. Hard to believe what Collinsdouche was saying - they can't run it because Ben was out and they have not practiced it enough . All this discussion, and people are barely touching on what stood out to me in this game: turnovers in key moments. Pittsburgh had a winnable game going, and it looked like they were GOING to win until Heath Miller lost a fumble. That led to a Saints score, but still a winnable game with an onside kick recovery. That is, until Ben threw a pick to seal it for New Orleans. Bad playcalling, a bad day from Polamalu, bad protection at the line, the lack of a running game save for Mendenhall's 25-yard TD (or for that matter a passing game), all these are issues and part of the reason we lost. But when you're still in a position to win despite all that and you turn the ball over (TWICE!) in critical situations, you deserve the loss and the blame. "as I always say, if they've got a 'Legal Issues' bar in their Wikipedia page, you know they're usually bad news"
The McRib was worse than than Arians coaching...had one last night, blah!